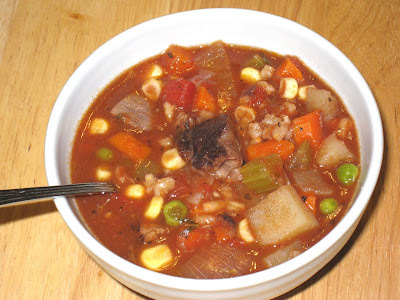 When I was a child, Campbell's Vegetable Beef Soup was one of my favorite lunchtime meals. The carrots, peas and potatoes were cut into uniform squares of soft mush, the beef was tender and quite flavorful, and there were little pearls of barley sprinkled throughout that were my favorite part. It is interesting to note that I absolutely hated cooked peas and cooked carrots, and was none too fond of potatoes either, unless they came to the table in fry or chip form. But there was something about the flavor of the broth that made all of them taste good. Somehow, it made them all taste the same, and together they created a flavor profile that was miles away from how any of them tasted on their own. I would spoon out and slurp up all of the liquid first, and then eat the remaining vegetables and beef like a stew. After I grew up and developed an appreciation for peas, carrots, and potatoes on their own, that mushy sameness of flavor palled and I outgrew the canned vegetable soup. I wanted to make my own, but I wasn't sure I could achieve the same kind of consistency I remembered from the condensed version using fresh vegetables. And I had no idea which cut of beef to use to get the right texture and flavor. But now that I've been braising so successfully, I brought home some beautiful beef shanks that my butcher assured me were perfect for making soup. He hasn't let me down yet, so I decided the time has come for me to tackle vegetable beef soup. I decided to make it a two-part process. The day before I was going to make the soup, I braised the beef shanks. First, I seasoned the shanks with salt and pepper and roasted them in a 400-degree oven for 15 minutes to give them a good sear. 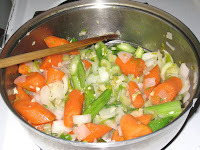 While they were roasting, I sauteed onions, celery and garlic in my braising pan for a few minutes, then added carrots and the fennel stalks left over from my pot roast. I tied together several sprigs of fresh thyme and rosemary and threw that in as well. After the meat was seared, I nestled it among the sauteed vegetables and poured about a half a bottle of Marco Real Tempranillo in (of course any red wine will do), covering the meat about two-thirds of the way up. I brought it up to a simmer, then lowered the heat as low as it would go, covered the pan, and let it cook for about two and a half hours, until the beef was tender enough to shred a little when I pulled at it with a fork. I removed the beef from the pan and let it rest. I took out the tied thyme and rosemary stalks and then I strained the broth from the vegetables, and then stored the beef with its broth in a container in the refrigerator overnight. I discarded the braising vegetables; they had done their work and had no real flavor left in them. The next day, I was ready to tackle the soup. And it was everything I hoped it would be, and had been afraid I would not be able to create. The vegetables were soft and tender, but not mushy. Each retained its individual flavor, but they all worked well together. 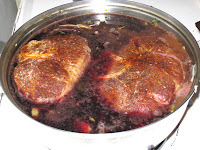 The beef was tender and full of flavor, and the wine lent fullness of body that made the soup rich and hearty. The barley pearls added a chewy contrast that made this the perfect dish for a freezing winter day. This made enough soup for me to freeze half and still have enough for lunches for the week. The final kick is that the collagen in the beef shanks makes the soup incredibly thick; I had to thin it out with water after the first day. So I guess I've truly created my own brand of condensed vegetable beef soup. Heat oil in large soup pot over medium low heat. Add onions, celery and garlic and cook until just translucent, about three minutes. Add carrots and cook another three minutes. Add potatoes and liquid from beef shanks, broth, and enough water to cover all of the vegetables. Add thyme; season to taste with salt and pepper. Bring to a boil, reduce to a simmer over low heat, and cook for about 15 minutes, until potatoes are just beginning to soften. Add barley and stir. Continue to simmer on low for about 50 more minutes, or until barley is cooked through. Halfway through, add the cubed beef. Add peas and corn and cook until just heated through, about 10 minutes. Can be made ahead and frozen. If soup thickens overnight, just add water to desired consistency.